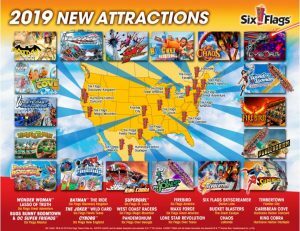 August 30, 2018 – Chairman, President & CEO of Six Flags, Jim Ried-Anderson, announced the lineup of new attractions coming to each of the Six Flags parks in 2019. Ranging from roller coasters to water slides to new kiddie areas with family friendly rides, this is by far the largest group of new additions the chain has made due to the acquisition of five new properties earlier this year. New coasters are coming to Six Flags Magic Mountain near Los Angeles, California, Six Flags Great America near Chicago, Illinois, and Six Flags Discovery Kingdom near Oakland, California, while Apocalypse: The Last Stand at Six Flags America near Washington DC will be converted from a B&M (Bolliger & Mabillard) Standup coaster into a Floorless one called Firebird. West Coast Racers, Magic Maoutain’s 20th coaster, will be the world’s first quadruple launch twin lap racing coaster. The Premier Rides möbius coaster sponsored by West Coast Customs will reach speeds of 55 mph (88.5 km/h) and will feature four inversions. Maxx Force, a S&S compressed air launch coaster, will feature the world’s tallest double inversion at 175 feet (53m), the fastest launch in North America going from 0-78 mph (0-125.5 km/h) in 2 seconds as well as the world’s fastest inversion at 60 mph (96.5 km/h). Six Flags Great America’s 15th coaster will also feature five inversions. The one coming to the San Francisco Bay area will be Batman: The Ride, a S&S 4D free spin coaster that stands 120 feet (36.5m) tall, has a 54 foot (16.5m) drop and goes 38 mph (61 km/h), but it’s really all about spinning (or flipping) head over heels as you traverse over 1000 feet (305m) of track. This is the seventh one of these free fly coasters to open at a Six Flags park. 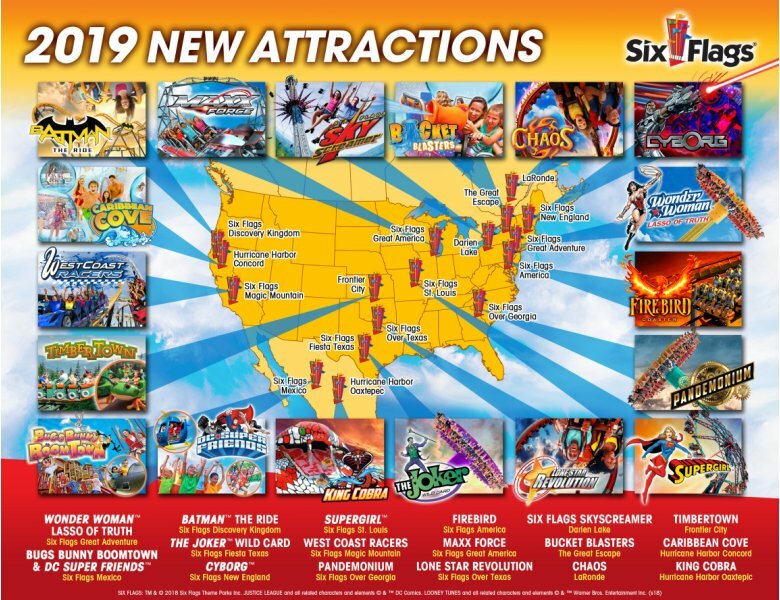 Lots of flat rides are also opening including two Zamperla Giant Discovery rotating pendulum attractions – Wonder Woman: Lasso of Truth at Six Flags Great Adventure in Jackson, New Jersey and the Joker Wild Card at Six Flags Fiesta Texas in San Antonio. At 172 feet (52m) high and reaching speeds of 75 mph (121 km/h), both will match Crazanity, that opened at Magic Mountain in 2018 as the world’s tallest swinging pendulum ride. Six Flags Over Georgia is also getting one called Pandemonium, but it’s a bit smaller at 150 feet (46m) while reaching 70 mph (112.5 km/h). Darien Lake, one of the new properties near Buffalo in New York, will have the Empire State’s tallest attraction. Six Flags Skyscreamer is a 242 foot (74m) tall Funtime star flyer that spins riders around at speeds up to 35 mph (56 km/h). Two Larson Super Loops are also on the ticket. At 100 feet (30.5m) tall, Six Flags Over Texas is getting Lone Star Revolution, the world’s tallest matching Mardi Gras Hangover that opened at Great America in 2018. While La Ronde in Montreal, Canada gets Chaos, a standard 73 foot (22m) model. Six Flags New England and Six Flags St. Louis are both getting spinning rides called Cyborg and Supergirl Sky Flight, while visitors to Great Escape in Upstate New York will get wet on Bucket Blasters. Frontier City, a new property in Oklahoma City, expands with Timber Town, a new kids area featuring three new rides and two new kids areas in the form of DC Super Friends and Bugs Bunny Boomtown, with a total of 13 rides, will open at Six Flags Mexico. Six Flags Hurricane Harbour Oaxtepec in Mexico City will offer King Cobra, a giant water slide like its namesake at Six Flags Great Adventure’s Hurricane Harbour. See what our members are saying in our Forum discussions about the announcement, West Coast Racers, Maxx Force, Batman: The Ride, Firebird, Joker Wild Card and Wonder Woman: Lasso of Truth. This entry was posted in News and tagged announcement, Batman The Ride, Darien Lake, Discovery Kingdom, Fiesta Texas, Friebird, Frontier City, Great Adventure, Great America, Joker Wild Card, La Ronde, Lasso of Truth, Magic Mountain, Maxx Force, new for 2019, Over Georgia, Over Texas, Six Flags, West Coast Racers, Wonder Woman. Bookmark the permalink.